Poet : Tirujnaanasambandar nilamaa maninirath tharakkanai yirupathu karaththotalka vaalinaar kattiya vaaliyaar vazhipata mannukoil elamotilaiyilavangame yinjiye manjalunti aaliyaa varupunal vadakaraiyatai kurankaaduthuraye. 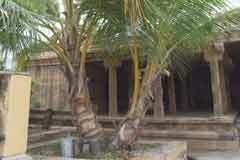 This is the 49th sacred place in the northern banks of Kaveri consecrated by Thevaram. Panguni Utthiram and Navarathiri ten days are celebrated with much fanfare. On the Karthigai day it is significant to see women circling round Amman 1008 times. 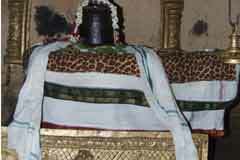 The Lord of this place graces us as Swayambu Lingam. This is a temple to be worshipped by pregnant women. The temple is open from 8am to12 in the morning and in the evening between 4pm to 9pm. Arulmigu Dayaanidheeswarar Tirukkoil, Vadakurankaduthurai – 614 202, Thanjavur District. The stone image of Nataraja, Sivagami Ambigai, Ardhnaareeswarar, Twin Bhairavas, Sooriyan, Naagar, Saneeswarar, Lingodhbhavar, Lord Brahma, Subrahmanyar, Kaasi Viswanaathar, Mahalakshmi, Chandikeswarar – all these deities are installed to grace the devotees. Hanuman also had worshipped here to be relieved off some of his sins. 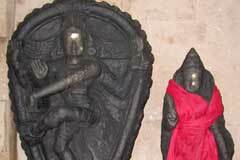 To worship the Dakshinamurthi here enhances the ‘gurubalam’, the strength of Guru. The offerings can be done by donning new clothes to Swami and Ambal, and by donating to the temple renovation. 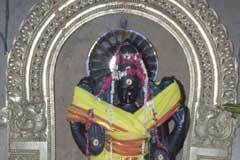 Pregnant women considerably visit this temple. It is usually said that the pregnant women should not go to the temples. 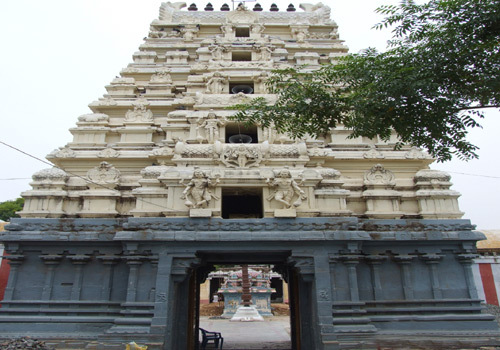 Since Lord Siva had graced a pregnant woman, the belief is that visiting this temple would result in safe delivery. 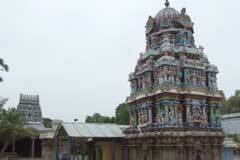 The place is consecrated by Tirujnaanasambandar and Arunagiri Naathar. 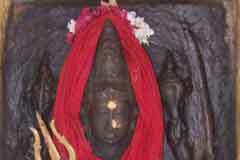 A person’s wealth gets increased, by worshipping Mahalakshmi of this place during Navarathiri days. Importance of Durga : Here Vishnu-Durgai graces us with Chakra and Conch in her hands. This Durgai has eight arms and it is surprising that if milk abhishekam is done to this deity, the milk turns blue in colour. In no other Durgai sanctum such a miracle happens. Mental strength gets enhanced by worshipping this miraculous deity, during the Navarathiri days. Lord Siva has revealed in many places His miracles. Kurankaaduthurai is the place where Vaali was graced to have his tail grown. It can be asked when Vaali’s tail got cut. Even Ravana was afraid of Vaali. It is said that perhaps the tail was cut when Vaali hit him hard with his tail. He prayed to Lord Siva that his tail should grow. 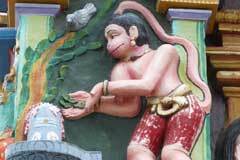 He came to Kurankaaduthurai, prayed to get back his strong tail and his tail grew. 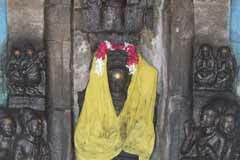 Here Lord Siva is called Dayaanidheeswarar. Ambal is Jataamakuta Naayaki. Here Lord Siva has bestowed moksa even to a sparrow. Hence He is also called ‘Chittilingeswarar’. He has poured mercy to all as His name ‘Dayanidhi’denotes. A pregnant woman, ‘Chettippenn’ with acute thirst was walking along near this temple. She was likely to die because of thirst. There was no water in the surrounding. As she was about to breathe her last, she worshipped the Sivalingam there. Lord Siva appeared, bent the nearby coconut tree, plucked the tender coconut and gave her. The lady’s thirst was quenched. So, there is also the name to the Lord, ‘Kulaivanankinaathar’. Miracle Based: The Lord of this place graces us as Swayambu Lingam. 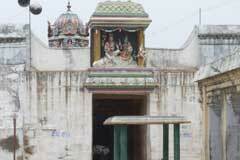 This sacred place is at 20 kms distance in the Kumbakonam-Thiruvayyaaru route and from Thanjavure 57 kms.